I liked My Name Is Lucy Barton well enough, but I remember wishing I had read it in a book club, where discussions might have explored some of the subtext and the minor characters. So I was thrilled when I realized that’s exactly what Strout has done here, in this collection of nine short stories that are linked through the shared characters (now grown-up) of Lucy Barton’s childhood, including Lucy herself. Linked stories are my favorite structure of fiction, and here the linking is used to perfection, deeply exploring characters from a full-frontal perspective in one story and then from sideways glances in others. These characters and their stories interested me so much more than Lucy Barton ever did ... although they do make me want to re-read Lucy Barton, just to encounter the first mentions of them again, now that I know them so well. Linked stories from Lucy Barton's home town and the people that made up the town. First story features Charlie, former maintenance man at the school the Barton children attended, a kind old man who remembers Lucy as was kind to her, though many weren't. The Barton's too poor and in fact Lucy's brother Pete still lives alone, in the dilapidated house of his youth. Charlie makes a point to visit this lonesome and strange man though he has good reason to write the whole family off as you will see when you read this wonderfully thought out novel. I did not read "My Name is Lucy Barton" but I want to now. I got a glimpse into her life from this book but not a lot. This book was about the characters that were in Lucy Barton's hometown. They were quite the crew. The majority of the book was about and written from Tom the janitor's point of view. He is the one to share what he saw of Lucy while she was growing up. There is also Lucy's remaining family, her brother and her sister. You get a real feel for what life was like growing up in that house when the three of them get together when Lucy, on a book tour, visits the town she left so long ago. Definitely a sad read, but I did enjoy it. For me Elizabeth Strout’s strength as an author lies both in the depth of her characterizations and her remarkable style. Her newest offering, ‘Anything is Possible,’ is again a straightforward story of seemingly ordinary people presented with both great insight and deceptively simple words. Strout readers will find familiar terrain in Amgash, Illinois, a small farming community where local memories and class prejudice run deep. The book is actually a collection of short stories, focusing on the inhabitants, their families and their collective memory. Life in Amgash, the childhood home of Lucy Barton ( heroine of an earlier Stout novel of the same name) isn’t easy. The reader meets, among others, Lucy’s siblings Pete and Vicky, as well as the farmer-turned-janitor Tommy Guptill and guidance counsellor Patty Nicely and her siblings. Family matters in Amgash; the bonds of family resonate throughout the stories. On the surface, Stout’s stories are sometimes dark and often painful. People aren’t always good to each other. Amgash has more than its share of bad behavior. But like Lucy Barton, most of Stout’s characters are survivors who rise above cruelty to respond with kindness. Patty is able to help the student who belittles her; Tommy visits the son of the man who attempted to destroy his way of life, and Lucy is able to return to her own family and reconnect with her siblings. Perhaps ‘Anything Is Possible’ is a book that we all should read and take to heart. In this collection of linked short stories, Strout expands on the lives of several people mentioned in My name is Lucy Barton. It stands alone, you don't have to have read Lucy Barton to appreciate these stories of small town life, love, and loss. Strout is one my favorite authors and this one does not disappoint. Loved it. In Anything is Possible, Elizabeth Strout revisits the world of Lucy Barton (who we met in 2016 in her novel, My Name is Lucy Barton). These linked short stories are reminiscent in form of Strout's acclaimed Olive Kitteridge. Anything is Possible takes a look at the people of Lucy Barton's hometown after Lucy has moved to New York City and become a writer. Strout's focus is on class and subclass prejudice and distinctions. As in her earlier work, she has a talent for creating sympathy for the most unsympathetic characters she encounters. I went back to Illinois , to Amgash, the small town Lucy Barton came from . I met the people who grew up with her and the adults who remember her family and their hard times. I met the school janitor who looked out for Lucy, the little girl, who wanted to be alone . I met the Nicely sisters and found out what the future had in store for them. Lucy and her mother had spoken of them. Each one in a different chapter, all citizens of that small town, with a story , that is full of hope and sadness and the realizations that escape us as we move forward in our lives day by day. Lucy, herself returns for a chapter with her brother Pete and her sister, Vicky. They sit in the old house and they remember. With laughter and then pain. Dottie Blaine running A Bed and Breakfast , learning that folks like to talk if they have someone who will listen to them. Abel Blaine, who made it out of the poverty and keeps apologizing for doing so. The story flows from chapter to chapter, character to character, all interwoven seamlessly . You won't easily forget these people and their stories but then when Elizabeth Strout tells you a story you aren't expected to. A special thank you to NetGalley and Penguin Random House for an ARC in exchange for an honest review. Strout is simply a gift. Her writing is breathtaking, gorgeous, and heartbreaking. Written in tandem with My Name Is Lucy Barton, Strout draws on the small-town characters that Lucy and her mother talked about—we are given insight into their lives and learn how their stories are woven together in this work of fiction that reads more like a novel than a compilation of stories. In My Name Is Lucy Barton, the work speaks to the reader on a different level in that it was more about the nuances and what was left unsaid. This book is more character driven, examining the human condition, stories of love, loss, and hope. If you haven't read Elizabeth Strout's novel, Lucy Barton, prior to picking up Anything Is Possible, that would be a shame. Not because you actually need to have read it in order to appreciate this new novel. Just because it was such a fine, delicate, book. Full of sadness and, despite the sadness, hope. And that, in a way, very much characterizes Strout's latest novel as well. Sadness, piles of sadness, and yet glimmers of hope. Lucy Barton is a character in Anything is Possible, though she only appears in person in one chapter. But she is there in all the other chapters as well, through the friends, relations, and acquaintances who connect to her life. And if Lucy has grown up in abject poverty and worse, then she is not alone. Indeed, nearly everyone whom Strout focuses upon here is burdened by suffering or sadness (these are not the same). A few are severely disturbed, even dangerous. But most are merely helpless victims of their environments, their families, or their compulsions. It would be very bleak reading if it weren't for the surprising (is it surprising?) rays of light that break through. Lucy is one of these, but she is not alone. In their small ways, nearly everyone who has survived their childhood has found some measure of grace. I don't know if that is Strout's general view on life or just a reflection of these particular characters. But it makes for compelling reading. Did linked short stories exist before Elizabeth Strout? If so - does anyone do them better? I read the book twice, just to enjoy mapping out the connections. These nine stories are actually spokes around the wheel of Strout's previous work, the novel My Name Is Lucy Barton. Each character tracks back to Lucy - siblings, teacher, custodian, cousins, friends - and some yield up painful information about Lucy's desperately impoverished childhood. "Sister" is the central story that brings together the three siblings - Pete, Vicky, and Lucy - in a reunion that contains all the pain on earth, with a tiny bit of redemption. One story takes place in Maine, and the rest in rural Amgash (just the place name along - ugh) Illinois. The paucity of any true community between these citizens and neighbors may be the most frightening aspect of the tales - except for Lucy's mother - whose son says, "I don't know about her in some big way." Quotes: "Yvonne, in her youth, most likely had not come from much. Shoes always gave you away." "Mary had spent more time thinking about Elvis than anyone could have imagined, and in this way the pleasure of her mind - because it was her mind and could not be known by others - had developed early in her marriage. In her mind, she had looked into his lonely eyes and let him see that she understood him." I really don’t know how to do an overview for this read. This is a tale which is more about a small town and its myriad of people. There are a good many characters and it is disjointed in places. But the stories surrounding each of these players keep you moving along and wanting to know more. The characters each have their own hang-ups and personal issues. Each one struggling to over come, well, life! The novel doesn’t have a main character unless it is Lucy Barton but, she has a minor role. I probably would have enjoyed this book more if I had read My Name is Lucy Barton first. I have it in my TBR pile. Just have not picked it up yet. I did not realize this novel was a sequel, or contained the same characters. However, no one writes a story quite like Elizabeth Strout. I love how she weaves love of friends and family along with pain, loss and sometimes abuse. She creates stories impossible to forget and the tales stay with you long after the book is finished. Brilliant book. It is so good to read her books. Mostly I complain that books are too long but this book could have done with another 100 pages. I'm not sure that I would suggest this title to anyone. I kept waiting for the redeeming ideas. The "professional" reviews talk about grace and optimism, overcoming adversity. I just felt sad and upset through every chapter. Since I enjoyed My Name is Lucy Barton, I looked forward to reading this follow-up. It can be read as a stand-alone but having read Lucy helped me realize her connection with people from her small hometown in Illinois. This is a book of short stories about people tied in some way to Lucy. Lucy even makes an appearance in one of the stories, "Sister." 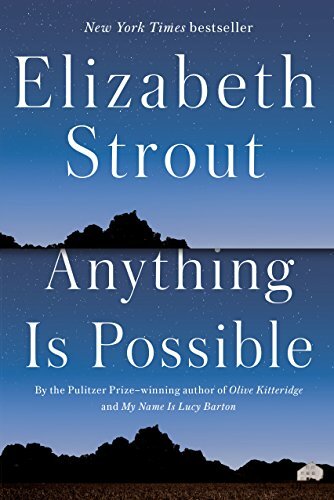 If you liked Elizabeth Strout’s My Name is Lucy Barton (and almost everyone who read it had good things to say about it), you are going to absolutely love Strout’s follow-up, Anything Is Possible. My Name Is Lucy Barton largely took place in Lucy’s hospital room while she and her mother talked about people they both knew from the little town in which the Bartons lived. If the Bartons were not the poorest family in town, they were certainly among the very poorest, and Lucy and her mother largely judged their neighbors as a reflection of how those people treated them and the rest of the Barton family. That, however, does not mean that their assessments of those they discussed were always the same, leaving the reader to wonder sometimes which of their characterizations was the most accurate. In Anything Is Possible, Strout fills in the backstories of many of the characters Lucy and her mother discussed in that hospital room. And because Strout has revealed that she more or less wrote the two novels simultaneously, Anything Is Possible is even more intriguing than it already would have been. This time around, the author uses a group of what at first appear to be a collection of standalone short stories that turn out to be so interrelated that they morph into an even more satisfying novel than Lucy Barton was. And that is saying a lot. There are stories about Lucy’s mother, her siblings, one mentally-unstable Vietnam War veteran, some of the town’s richest residents, and several others from Lucy’s past. Lucy herself makes an appearance in a story titled “Sister” in which we learn that the trauma of growing up dirt poor as member of a family looked down upon by the whole town has emotionally crippled her for life. Lucy, now a well-respected novelist, seems caught between two worlds when she finally pays her hometown a visit after several years of absence – so much so, in fact, that she suffers a panic attack of sorts that has her fleeing Amgash in pure desperation to escape the childhood memories being there stirs up for her. In this novel, the author has continued the saga of “Lucy Barton”, the title and character in her book of the same name, but it is now decades later. Lucy was raised in Amgash, Illinois, a small town with neighbors that seemed overly critical of each other, often exhibiting ridicule when compassion would have been the better option. It also seemed overly populated by troubled residents. After Lucy left Amgash, as a young girl, she never returned until now, as a much older woman. The author reintroduces many of the people she came in contact with during her difficult and troubled childhood. Those who influenced her life in some way and who were responsible for the adult she became were reintroduced in this book. Who they were, who they became, and why, is the substance of the story. There were times that I felt the narrative was disjointed, as so many characters from the previous book were recreated and connected to her past. Coincidentally, in one scene, in the same way that Lucy and her mom had a meeting of the minds in the first book, two other characters did the same in this book. Angelina and her mother Mary seemed to reconnect across the distance of miles and time, with a heart to heart conversation that was at once very difficult, but also very revealing and cathartic for both. Every character seemed to have a story to tell, a horrifying secret to reveal, or a relationship to reconcile. There was nary a character that seemed to simply grow up happily and unscathed. They all had some dysfunction, greater or lesser, with which to contend. All of the characters seemed to leave a trail of confusion or pain in their wake as they grew older; some still seemed scarred even after experiencing a sudden revelation that made them understand or accept their past or that made them able to find a pathway forward. The author tried to reconstruct the characters as each new scene began, but at times I thought perhaps there were simply too many to keep track of or remember. Still, although it was a bit convoluted at times, the characters did take on a life of their own, even if not always believable. The nature of the novel made it repetitive at times as each character related something of their past and explored their memory of events connecting them to each other. There's no way that I can write anything that accurately sums up my reaction to Elizabeth Strout's new book, Anything is Possible. In form, it's most closely related to Olive Kitteridge, being a collection of closely related short stories about people from Amgash, the small town where the protagonist of Strout's previous novel, My Name is Lucy Barton grew up. Amgash is a struggling agricultural community, whose residents work as high school guidance counselors, janitors, nurse's aides and housewives. Those who leave enjoy broader prospects, but are nonetheless shaped by the town they grew up in. Lucy Barton's existence hangs over the town; she's a success story, but the residents are ashamed of how she and her family were ostracized and of the bleak poverty that clung to them.